A lehető legkevesebb esélyt a CO-mérgezésnek! The Promtherm Agria Combustion Ltd 1991 Eger operation of the Prometheus company was founded as an independent company. In recent years the Company has been greatly transformed. In order to serve our customers' complex business significantly expanded our scope. 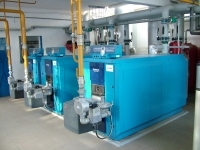 The first few years were mainly municipal and industrial gas and oil burners servicing, but now our activities include: the Promtherm Agria Combustion Ltd 1991 Eger operation of the Prometheus company was founded as an independent company. Buderus and wholesale sales of Grundfos products. We trusted subcontractors involving chemical is water -side space cleaning, heating systems, thermal insulation, builder works. In recognition of our company, our company more reputable dealer activities mandated duties. Among other things, Buderus, Saunier Duval, Danfoss, Weishaupt, BWT, Junkers, Vaillant, Riello. These systems are installed accordingly entitled to and beyond the warranty and repairs carried out. 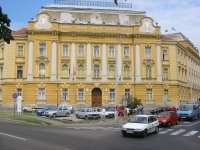 Promtherm Agria Ltd has been performing its servicing activity in Heves County (Hungary) since 1991. Our mechanists attend technical trainings several times a year to develop their skills in the field of installing and repairing equipment professionally. The number of customers is increasing year by year, which confirms that our company has both professional and instrumental background which ensures high quality services. 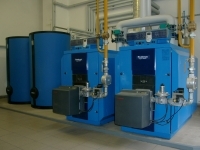 Our firm is entitled to install and to maintain the following equipments: ARISTON, BERETTA, BUDERUS, BWT water softeners, CHAFFOTEAUX, ELEKTHERMAX, FÉGTHERM, FERROLI, GASZTROMETAL, HÕTERM, JUNKERS, KÕRÖS KAZÁN, HERMAN, QUADRIGA, RAPIDO, RIELLO, ROBUR, SAUNIER DUVAL, SAVIO, SIME, TERMOMAX,VAILLANT, WEISSHAUPT, MMA gas detectors. Our company undertakes the operation of boiler rooms and our specialists –mechanists and engineers – ensure a safe and economical operation at a high comfort level. All-the-time control is insured by a process controlling appliance and its system. supplementary activities along with servicing such as installing water treating equipment, electrical works, insulation, chimney works. We mainly operate within Heves County. We also undertake the installation and in most cases the operation of the finished system. Quality work, simple and automatic as well as safe operation has of great importance. As for materials and items to be built in we prefer products at a higher price when implementing, cost-saving and reliable in the long run though. We are ready to serve our partners with a solid technical background and with a highly experienced and skilled staff. Our customers are welcome to our show-room in Eger, 130 Mátyás király út, where a full range of Saunier Duval heating products are available and where you can buy Grundfos products at whole-sale and retail prices. We also distribute fittings and parts for gas detectors, water softeners and gas and oil heaters being serviced by us. 3300 Eger, Mátyás király út 130. © 2019 Promtherm Agria Kft.